Can you fly with CBD oil? Can You Take CBD on a Plane? Why Use CBD for Flying? 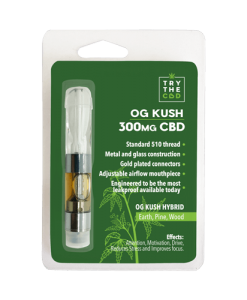 USE THE COUPON CODE: FLYCBD and SAVE ANOTHER 10% OFF OUR LOWEST PRICE INCLUDING ITEMS ON SALE! Ready to Invest in CBD for Flying? Traveling with CBD is a common cause for questions. Many CBD users have debilitating illnesses that do not allow for travel, sure. But many CBD users are frequently on the go. Their stressful or active work life may be the reason they take CBD in the first place! CBD for flying is a natural question for CBD users who plan to travel at all. Those of us who are regular users of CBD can understand the dilemma that without CBD our days cannot just start. One of the basic questions that a traveler might ask is that is CBD allowed on a plane? There is this one group who just like to use CBD and would like to carry with them while they’re flying. On the other hand, there is this group of people who use CBD because they are in fear of flying. We all know that CBD can change a person’s anxiety when boarding a plan. CBD helps in soothing down the nervousness when they travel on an airplane. And let’s admit, who doesn’t get scared of flying high in the sky? There is a bundle of reasons why anything can go wrong. These are some just of things that can go wrong when one is traveling and its okay to get scared about it. However, this brings up a lot of questions. 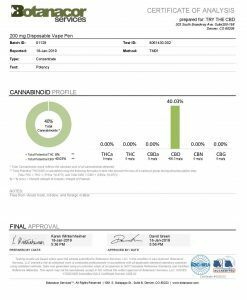 Are there any specific rules about traveling with CBD? Can you take CBD on a plane? 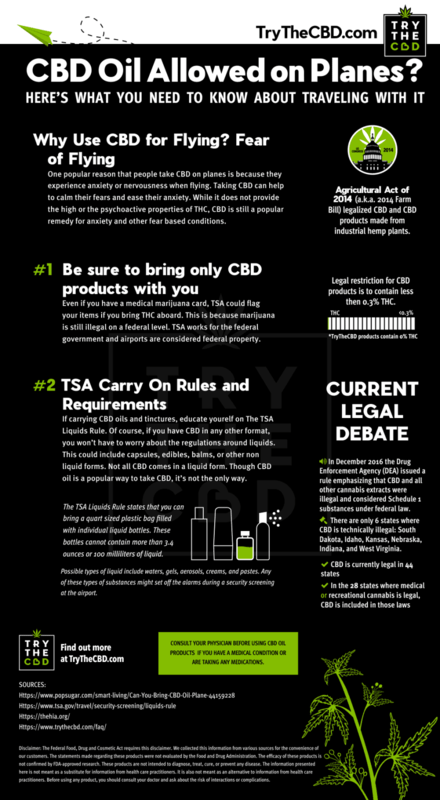 What are the TSA CBD oil rules? Before jetting off, you should be well informed enough that you no longer have to ask can you take CBD oil on a plane. You should do your research and make sure you are well informed and prepared for liftoff. 2019 UPDATE: Recently President Trump Signed 2018 FARM BILL which has expanded the cultivation and production of hemp and hemp derived products (HEMP EXTRACTED CBD) to all 50 states. This has also given farmers who decide to pursue hemp cultivation access to federal grants, banking, crop insurance, and many other benefits. Can you take CBD oil on a plane? This is a question that Try The CBD customers ask us often. In this article, we provide valuable insight into CBD for flying. There’s a lot to know, but as long as you do your proper research, you will feel comfortable and prepared moving forward. It all is about taking the necessary steps that will help you figure out what needs to be done. Flying is already anxious enough and taking CBD with you can be even more anxious, to begin with as not a lot of people know about the rules regarding customs. The bottom line is that yes, you can take it with you, which means that you don’t have to worry about a thing. Traveling with CBD products doesn’t have to be a hassle or add to your worries in any way. At the end of the day, as long as you are complying with the TSA CBD oil requirements, you should be good to go. First, you have to ask yourself why this is even something you need to know about. What is your purpose in carrying CBD along with you, and what are your concerns? Of course, you should first look into why you might want to use CBD for flying in the first place. In some cases, you don’t want to use CBD on the plane — you just want to be able to travel with your supply of CBD. That’s perfectly normal, especially for people who turn to CBD as a natural remedy to alleviate symptoms of a debilitating condition they may have. In other cases, you might want to be able to use CBD specifically for the flight you’ll experience. Many people suffer from feelings of extreme fear or just general nervousness when flying. It doesn’t have to be that way. We’ll go over more on that below. As we pointed out earlier, there can be numerous reasons why one would want to CBD with him. The point is that the reasons themselves do not matter. The fact is that whether we’re afraid of flying on a plane or we just want to take CBD with us depends. One popular reason that people take CBD on planes is that they experience anxiety or nervousness when flying. Taking CBD can help to calm their fears and ease their anxiety. 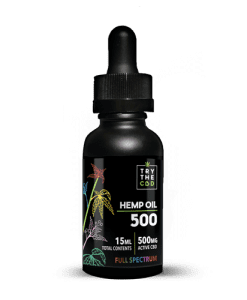 While it does not provide the high or the psychoactive properties of THC, CBD is still a popular remedy for anxiety and other fear-based conditions. Plus, taking CBD means you won’t be flying high. If you use a THC product before flying, it may not be a good sensation once you’re up in the air. Taking non-psychoactive CBD products eliminates this possibility. CBD, in essence, cannot get you high as it lacks the elements that induce a high in the first place. Cannabis has two main components, one is CBD, and the other is THC. THC is responsible for the high one experience. Once THC is separated from CBD, then you cannot possibly get high. CBD is derived from the part of the marijuana plant that is not psychoactive. It will not get you high, but it can still provide some of the amazing, soothing benefits that the rest of the plant offers to people. It can help you to chill out and ease your worries as you board the plane. Still, CBD is technically an active cannabinoid. So can you still travel with it? Is it legal? Can you cross state lines with CBD in your possession? But you should do so carefully. 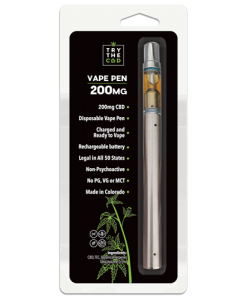 While CBD is legal across the United States of America because it does not contain THC, you still need to be careful about looking up the rules and laws wherever you go. This is a good practice to make a habit of if you plan to travel often. As a general rule, you can make it a habit that checking laws is a must when you’re traveling. Even though CBD is legal in most cases, there can always be a chance that you might get into trouble. The best way to do this is to go over the laws themselves. Once you are going to a new place, check out the laws on whether CBD is allowed to be carried or not. The main reason why CBD is allowed to be carried on planes is the fact that it does not contain THC, which is the psychoactive element in Cannabis. Other than that, the only thing you need to be careful of is just how much CBD you’re bringing on board. If you plan to carry on your CBD oils, the same rules apply that are enforced upon other liquids and substances. You cannot bring anything hazardous or flammable aboard. You also have to keep your liquids under a certain amount. We’ll go over more on that in the next section. Staying within CBD TSA requirements is essential for any and every flight. Never bring more than you are allotted to bring in your carry on or you may find yourself crying over the trash can as you’re forced to throw your items away. Of course, you should always be very cautious about what CBD products you bring. This is a good rule of thumb for flying in general. Even something as harmless as hair spray could cause a fuss in security lines! Make sure you look into the legality of whatever you’re carrying. And, make sure that your products contain no illegal substances. If your CBD oils contain even a trace of THC, you may find yourself in hot water. Always read and study the label and look into all of the active ingredients of whatever you plan to bring with you. Even if you have a medical marijuana card, TSA could flag your items if you bring THC aboard. This is because marijuana is still illegal on a federal level. TSA works for the federal government and airports are considered federal property. For this reason, you should not risk even carrying THC gummies or edibles with you. No matter whether you have a medical card or marijuana is recreationally legal in the state you’re traveling to or from, you could get in trouble. It’s not worth the risk, so always proceed with caution and only bring CBD products with you. 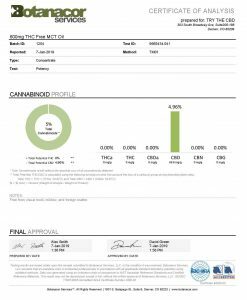 If your products contain any bit of THC, you need to be aware of the THC to CBD ratio and make sure you are not breaking any rules. 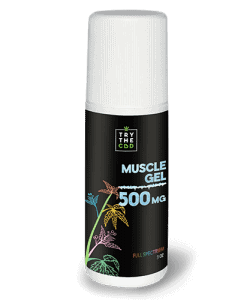 One way you can avoid all of this fuss is by buying and bringing CBD hemp oil, which comes from hemp plants. There is no psychoactive component to these substances. Before packing for the airport or boarding your flight, you need to educate yourself on the TSA’s rules and regulations. The rules that will apply most to this scenario are the rules surrounding the amount of liquid you can pack in your carry on bag. The TSA Liquids Rule states that you can bring a quart-sized plastic bag filled with individual liquid bottles. These bottles cannot contain more than 3.4 ounces or 100 milliliters of liquid. You cannot carry on any containers larger than that. If you try to get through security with bottles of liquid that contain more liquid than that, chances are that the security scanner will stop you. Unfortunately, the rules will dictate that you have to throw these items away. Something that may surprise you is if you have a larger container but it’s not full, you still can’t carry it on. For example, let’s say you have a 6-ounce bottle of shampoo. Even if it only has a little bit left in it, you can’t bring it. It doesn’t matter if the actual amount of liquid is at or below 3.4 ounces. If the size of the container can hold more than that, you’ll have to get rid of it before you can pass through the security screening checkpoint. When packing, you should put the small liquid containers you want to carry on the plane into a separate plastic bag. Store it somewhere easily accessible so you can take it out quickly when it’s time to go through security. You’ll have to remove it from your bag and run it through the scanner in a bin of its own. This is standard procedure in airport security lines. Just make sure you’re prepared. You don’t want to be that annoying person holding up the line. Also, when packing, you should put any liquids that are larger than 3.4 ounces into your checked bag. The rules permit them in there — as long as they’re safe and legal substances to transport. Explosives and other products are of course not allowed on planes under any circumstances. Packing with these requirements in mind ahead of time will ensure that your experience at the airport is smooth and hassle-free. You don’t want to have to throw away any items just because you packed them in the wrong place! Follow these requirements when trying to pack CBD for flying. If your CBD products are liquid, make sure the container is not larger than 3.4 ounces. Otherwise, you won’t be able to bring it with you. You’ll have to part ways with it at the airport. As long as you’re carrying on a legal substance, the security scanners should treat it just like any other liquid. Of course, if you have CBD in any other format, you won’t have to worry about the regulations around liquids. This could include capsules, edibles, balms, or other nonliquid forms. Not all CBD comes in a liquid form. Though CBD oil is a popular way to take CBD, it’s not the only way. Possible types of liquid include waters, gels, aerosols, creams, and pastes. Any of these types of substances might set off the alarms during a security screening at the airport. 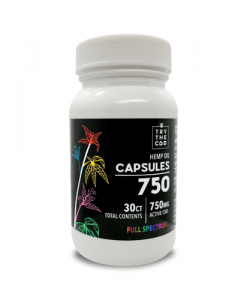 Still, even if you use CBD capsules, you should make sure that these capsules are solid. Make sure they do not contain liquid inside. If they do, you’re running the risk of carrying on more liquid than allowed. If this happens, security personnel are likely to stop you in the security lane. This is so that a TSA agent can search your bag. Whatever form of CBD you like best, you should have no problem traveling with it. Just make sure that the substance is allowable on the aircraft and ensure that it remains within the rules regarding liquid amounts. If you’re ready to purchase some CBD for flying now that you’ve received the answer to the question can you take CBD on a plane, you’ve come to the right place! 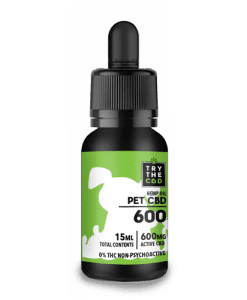 Now that you know the TSA CBD oil rules browse our wide selection of CBD products to find one that’s a right fit for you. 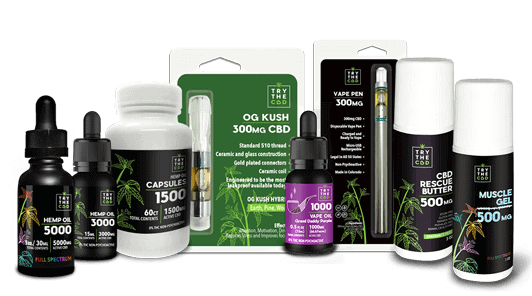 Whether you want to take CBD to ease your fears of flying or simply need to find a good product you can travel with, we have whatever it is that you need. No need to wonder anymore can you take CBD oil on a plane. Now, you know that if you’re going to bring CBD in liquid form on the plane, you simply need to make sure that it complies with the existing TSA CBD oil regulations. 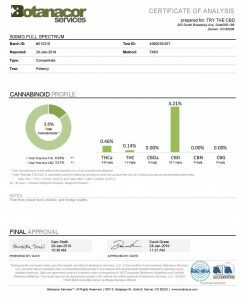 We sell CBD TSA compliant options. 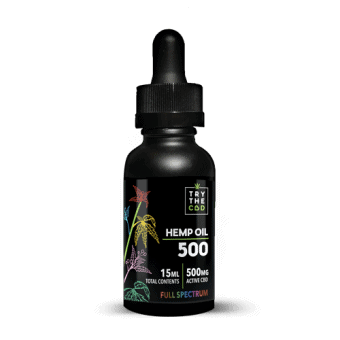 You don’t have to purchase CBD products in liquid form. Instead, you could choose solid capsules or a variety of other formats. For example, maybe you opt for a lip balm or a vaporizer. You will need to pack the items accordingly, but traveling with them should not be a hassle. Don’t hesitate to reach out and contact us if you have any other concerns, questions, or compliments. We’re here to help. We stand behind our products. We also have a customer service team at the ready to assist you with your order. Infographic Can You Carry CBD Oil On Planes? This entry was posted in In The News and tagged can I take cbd on a plane, can you fly with cbd, can you take cbd on a plane, cbd for flying, tsa cbd oil.